Do you often find yourself scrambling around at the last minute looking for a gift for a special one's birthday? 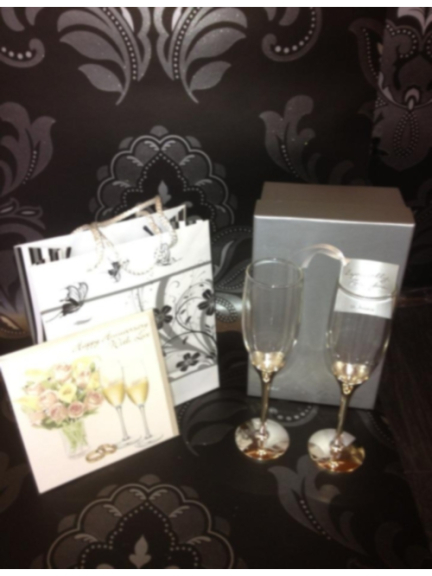 Or stuck for ideas when it comes to thinking of something to get the happy couple on their wedding day? Well, Boutique 370 @ John Julien have got the perfect answer to all your gift-buying needs. And at fantastic prices too. For instance, you could buy that difficult friend of yours a great, luxury gift bag containing a beautiful hand-made card decorated with care and attention, and this season's latest leather necklace with a diamante clasp. It ticks all the boxes, is convenient, and at a great price. And you can get similar sets but with earrings and pens for the same price. Maybe you have a wedding to attend, and the couple hasn't registered for gifts. What can you get that works for the two of them, and is within price range? The wedding bag is, again, designed with luxury in mind and contains a fantastic occassion card as well as boxed his and hers pens with diamante embellishment. They could also work perfectly as an anniversary present. Or, how about a touch of class for that friend who really deserves something special (note: that friend could be yourself). For £99.95, get a sterling silver diamante necklace, sterling silver diamante stud earrings and a dazzling crystal clutch bag with a diamante clasp. And they all match perfectly, allowing you to complete your outfit in style. The gift-bags are varied, and contain great quality gifts at excellent prices. Other items within them include real-leather wallets, picture-frames, cuff-links, champagne flutes, and much more. And they all come with designer luxury gift-bags and hand-made cards. Perfect. If you'd like more information, why not call in to the boutique at John Julien International. Or, give them a call on (01204) 876757. Alternatively, check out their feature page here.